Instruments aboard NASA’s InSight lander are now gathering meteorological data from the Martian surface, allowing for daily weather reports that are being made available to the public. The daily weather reports from Elysium Planitia began on 11 February, and contain information about air temperature, wind speed, and air pressure, reports NASA. 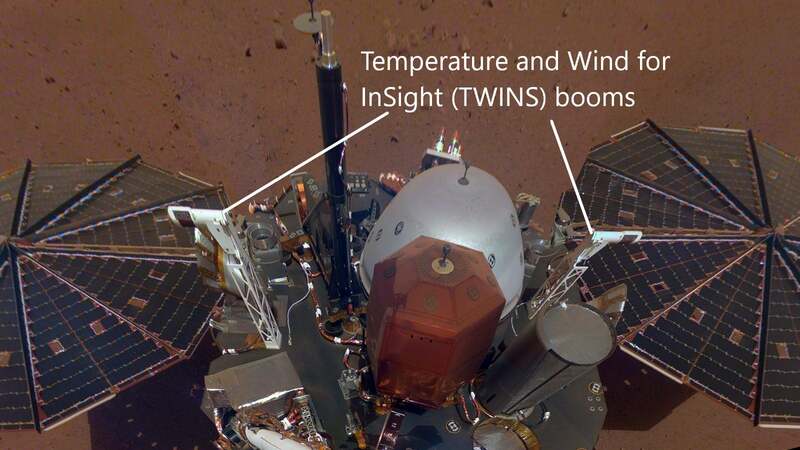 On Valentine’s Day, 14 February, the InSight lander detected a high of -16 degrees Celsius (4 degrees Fahrenheit), a low of -95 degrees Celsius (-138 degrees Fahrenheit), a top wind speed of 36.4 mph, and an average air pressure of 721.7 pascals. InSight landed close to the equator and is currently experiencing the Martian winter—a time when storms become more active. Remarkably, the probe is already picking up meteorological data to that effect, as Cornell University astronomer Don Banfield explained in a statement. To collect this information, InSight is equipped with a suite of sensors developed by NASA’s Jet Propulsion Laboratory, Cornell University, and Spain’s Centro de Astrobiología. These instruments, collectively known as the Auxiliary Payload Subsystem (APSS), collect data each second of every Martian day, or sol (one Martian day is 24 hours, 39 minutes, and 35.244 seconds). InSight transmits this data back to Earth each day, allowing for the daily weather reports. InSight will continue with this data gathering for the next two years, so in addition to the daily updates, we’ll get to see the bigger picture in terms of Mars’ seasonal variations. APSS consists of an air pressure sensor inside the lander, a pair of air temperature and wind sensors on the deck (called TWINS), and a magnetometer (the first to ever reach the surface of another planet) located on the edge of the deck. One of the TWINS sensors faces east and one faces west. This instrument will let the InSight team know if high winds are interfering with InSight’s seismometer, known as SEIS. Indeed, APSS is good for planetary meteorology, but it’s also crucial to the success of the InSight mission. 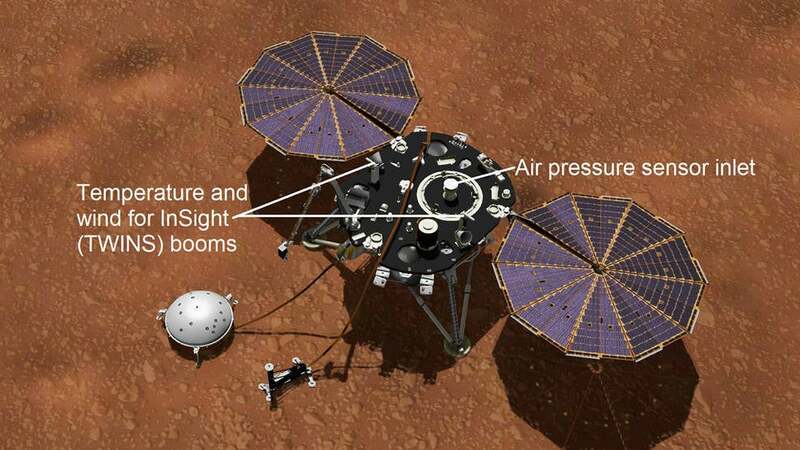 By monitoring the conditions around the probe, NASA scientists will know if weather is disrupting sensitive equipment, namely SEIS and the heat flow probe, both of which are now deployed on the Martian surface. Both instruments are affected by large temperature swings, and SEIS is particularly sensitive to air pressure changes and wind. Scientists don’t know how much wind it takes to lift dust in Mars’ thin atmosphere, which affects dune formation and dust storms—including planet-encircling dust storms like the one that occurred last year, effectively ending the Opportunity rover’s mission. APSS will also help the mission team learn about dust devils that have left streaks on the planet’s surface. Dust devils are essentially low-pressure whirlwinds, so InSight’s air pressure sensor can detect when one is near. It’s highly sensitive—10 times more so than equipment on the Viking and Pathfinder landers—enabling the team to study dust devils from hundreds of feet (dozens of metres) away. Interestingly—if not troublingly—preliminary information already suggests dust devils are common in Elysium Planitia. These low-pressure, tornado-like twisters spin at nearly 60 miles per hour (100 km/h).